In this post we discuss fire safety and fire prevention on a Portland industrial demolition site, or any demo site across the country. According to OHSA statistics, workplace fires kill over 200 people a year and injure as many as 5,000 individuals. Demolition employers have a responsibility to provide a safe workplace that is free of occupational danger, including exposure to fire. Let’s take a look at fire prevention tactics contractors can apply to prevent costly, dangerous fires on their job sites. Create a fire plan. Writing a fire plan is the first step in demolition fire prevention. A fire plan must describe the key duties of personnel in the event of a fire. Evacuation routes must be established. A fire plan should also outline which preventative measures will be taken before work commences, and how fire safety will continue during the demolition process. For instance, fire extinguishers and sprinkler systems should be provided as needed on the job site. Each city has its own way of dealing with fire safety in building demolition. Portland, for instance, folds fire safety into the site plan process. Demolition contractors must submit a site plan to the city, which is reviewed for fire safety and multiple other considerations. Include a Fire Engineer. A fire protection engineer acts as a liaison between demolition contractors and regulators. A network of fire safety-related relationships ensures smooth coordination of fire safety initiatives during all phrases of construction. The fire engineer can design and oversee the installation and maintenance of fire protection systems such as fire alarms. He or she can also analyze and set strong structural fire protection according to the architectural layout and mechanical systems in the building. The fire protection engineer understands how these various complex systems work together, and how to best coordinate their use for fire prevention. Establish Critical Alliances. For fire safety, demolition contractors must maintain two critical alliances: with emergency response providers, and with the local authorities who set fire codes. An established relationship with code authorities can help demo contractors create to-code fire procedures. 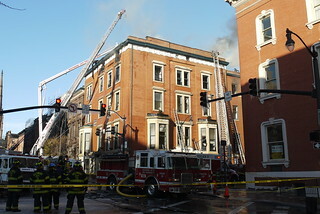 Regular communication with police and fire departments will allow for a smooth emergency response in the case of a fire. Occupied buildings are challenging for emergency responders, as these structures include dynamic environments and unknown hazards. These challenges are even greater for a building under construction, partially because on-side fire fighting/prevention equipment may not be functional. Getting in contact with emergency providers early in the demolition process will lead to better decision- making, especially during a rapidly unfolding emergency situation. Avoid Construction and Demolition Hazards. Demolition fire hazards are similar to those found in the all construction work. However, in demolition, fire prevention may be dealt with in reverse order. For example, when constructing a building, fire protection systems and barriers are constructed first. These are left in place until the end of the demolition phrase. Before demolition begins, electric and gas service should be terminated if possible. Those services that are left operational should be clearly labeled and marked. During work, a fire protection program should be in place. Pre-incident plans must be set, and pre-demolition visits from the local fire department must be conducted to inspect and assess the site. As work commences, fire safety must be prioritized at all levels of construction. This includes proper placement of extinguishers, regular disposal of flammable waste and non-needed materials, and ready access to water. The introduction of hazardous material must be monitored and accounted for. Fire protection systems must be installed before interior work begins. Adequate means of escape in case of fire must be provided for all employees. It is also advisable to take security precautions to prevent arson on your demolition site. The demolition contractors, the safety of employees and the public are the primary concern. Creating a fire plan, working with a fire engineer, and developing critical alliances all play key roles in preventing demolition fires. The more that demolition contractors educate themselves on how to prevent fires, the lower the incendiary incidence. This entry was posted in Demolition Safety, Industrial Demolition and tagged Building Demolition Portland, Portland Industrial Demolition. Bookmark the permalink.